Pilot Whales give birth throught the summer months.Gestation about 15 months and nurse for at least two years. The last calf born to a mother may be nursed for as long as 15 years.Calving interval is 5-8 years. 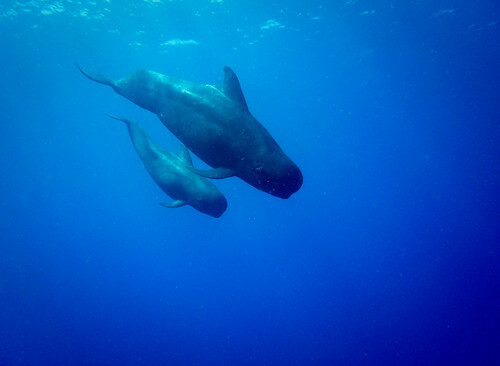 Older pilot whales do not give birth as often as younger females, and will eventually reach menopause. Maturity occurs around 10 years of age and maximum longevity is 45 years for males and 60 years for females. April and springtime means celebrating new life as our planet renews itself. 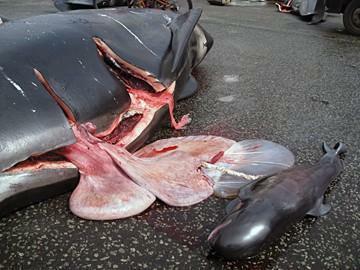 Unfortunately, for sixty pilot whales and their calves the month of April meant on the shores of the Faroe Islands. Pilot Whales are in fact not whales at all, they are part of the dolphin family. They have extremely large brains, and are highly social and intelligent, and live in complex societies. Mothers and their offspring stay together for a lifetime. They speak several dialects, and in captivity have been able to achieve complex tasks. Shouldn’t this be considered at a time when science has proven dolphins are higher beings. Religion and tradition are both used as excuses worldwide for hunting dolphins and whales. Sadly thanks to man’s polluting the ocean pilot whale meat tainted with Mercury and PCB’s causing Parkinson’s and defects in unborn babies. It seems if ever now is the time to end the hunt for the dolphins and for the children. Flex the magic western grey whale, on to California! This is our second post on this particular story, unannounced he slipped right by us here in Cannon Beach, and as a crow flies under our nose. It seems he is following a path along our outer continental shelf and heading at a rate much faster than estimated by OSU scientist Bruce Mate. Two weeks ago, he projected him to be off the mid-Oregon Coast by mid-February. Looks like he will be a good hunk of the distance to San Francisco by then. My wife accuses me of speculating too often but it is appearing more likely that he has done this before as his trajectory seems to have picked the shortest distances between two points. Equally important is the source of potential food, which based on my reading and understanding, would be at minimum during migration. But why has he positioned himself on the line of one of the planets greatest breadbaskets the coastal outer upwelling zone. Granted this time of year generates lower nutrients, sunlight, phytoplankton and zooplankton availability. Blooms may be sporadic but could provide sustenance (Gray Whales generally consume up to 0.4 % of their body weight per day about 12 lbs or 26 kg). Another source of nutrient pump potential is that of the recent migration of our coastal Gray Whales. Whale poop is big as it provides the same nutrient needs as deep ocean upwelling, which in turn keeps reasonable phytoplankton populations which result in higher invertebrate numbers desired by Flex and his folks. How little we know!!! In a recent blog I made the mistake of saying that Western Pacific Gray Whales were strictly found near the Sakhalin Islands which are of the east coast of Russia in the Sea of Okhotsk. Further they did not mix and were genetically separate making interbreeding most unlikely in regards to our closely aligned California Gray Whale. Flex was born in the summer of 1997 making him thirteen years old and one of only 130 living members of this species. By following the link below through Bruce Mate at the Oregon State University more exact information and specifics of this seemingly unusual migration can be found. Again I feel we have a creature screaming for help, for all we know there may be several traveling together, since Flex was the only one tagged. Credit should be given to the Russian branch of the International Wildlife Federation for attempting to stop further drilling for oil near the Sakhalin Islands. Therein lies the real problem, the search for and extraction of petrochemicals and its high decibel sounds.